Imagine receiving a stack of photographs from a second cousin you’ve never met, who received them from a fourth cousin who lives on a Portuguese island off the coast of Africa. 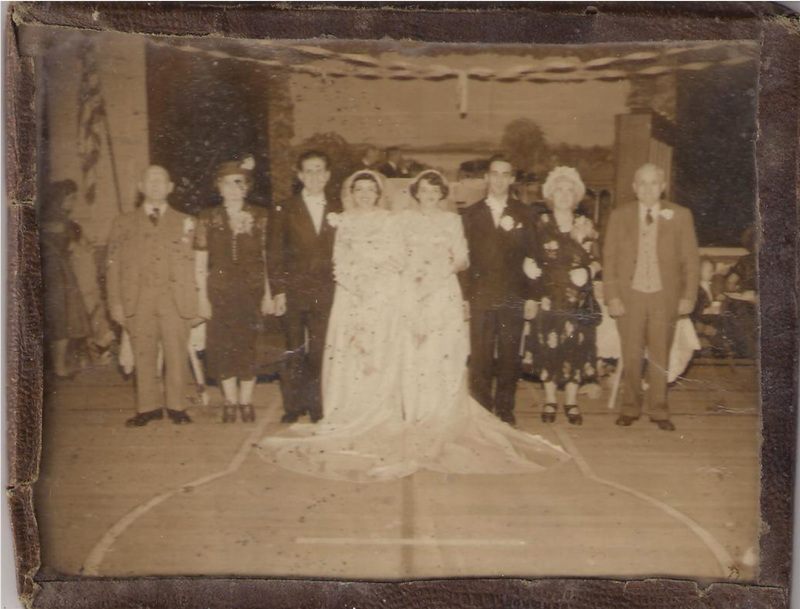 And that these photographs show never-before seen, everyday images from your great-grandparents’ life that they sent home to Portugal some fifty to sixty years ago. Sometimes, family tree breakthroughs happen just like that. They just show up overnight in your email inbox. Genealogists collect stuff. Names. Dates. Locations. Histories. Photographs. Family Artifacts. We revel in adding stories to the bare facts that form our family trees. In the days before computerized historical sources and internet family trees, a well-researched genealogy meant at least one, and maybe several, crates of stuff. A glimpse into one of these crates might reveal family tree charts, census transcription forms, or printouts of microfilmed newspaper obituaries and articles. And then, if you were well-entrenched in the hobby, that crate would probably hold correspondence (via snail mail) with relatives or fellow researchers who lived in different cities, counties, states, and maybe even countries. But, these researchers who shared your family interests were usually hard to find, and sometimes, even harder to reach. In those days, genealogy felt more solitary. Genealogists spent vast amounts of time, alone in a library or research center, pouring through old census records, old city directories, vital records, and microfilmed reels of newspapers. Finding potential leads, investigating those leads, and organizing records was largely an activity genealogists did on their own. Then, as now, some of the best breakthroughs in genealogy came through communication with other genealogists. Back then, this meant getting lucky with finding a phone number through directory assistance, or perhaps driving to a nearby town and knocking on a door of a second or third cousin. Nothing has made connecting with other genealogists easier than the internet and social media. This past week, I met my second-cousin Bea through her message that popped into my Ancestry account. I hadn’t met her before. Her grandfather – my great-grandmother’s brother, had to that point been an un-researched name on my family tree. Raphael Silva – born 1882, died 1969. That was about it. I had thought he probably had descendants, but hadn’t gotten around to researching this. Within a few minutes of receiving her message, I figured out that Bea and I share a common set of 2nd-great-grandparents who lived in Portugal‘s Azores in middle of the 19th century. Through her message, I also learned that she had already done some research on our Portuguese Silva family. 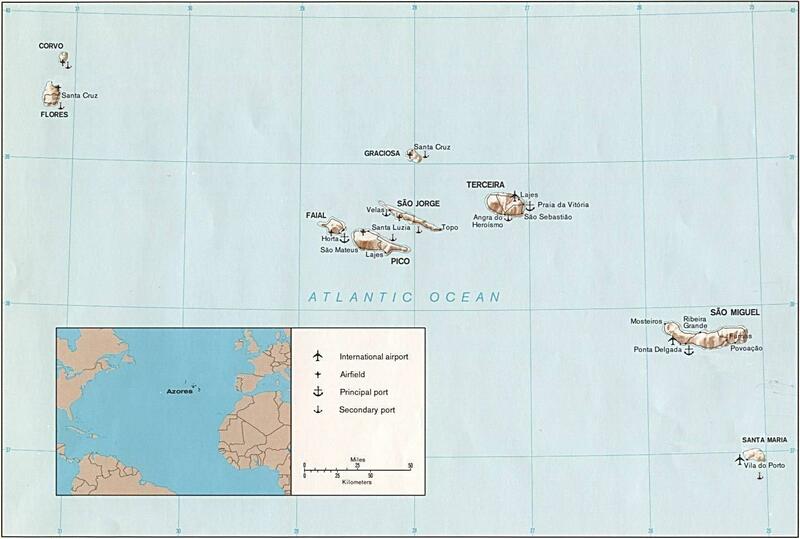 My great-grandmother, Augusta Silva, left Santa Cruz on Portugal’s Graciosa Island in 1907. She came to the United States a young woman, not yet 20, and settled in Lowell, Massachusetts, a textile mill city with a substantial Portuguese population. Soon after arriving, she married Joseph Machado, also from Graciosa Island, who was 11 years her senior. Throughout her life, she kept in touch with the family she left behind on Graciosa. I had always figured that had been the case. What I didn’t know was that, over 100 years later, the descendants of that family on Graciosa would still remember her. I never could have guessed that they would still have the photographs she had sent them in the 1950s and 1960s. This photograph shows my great-grandmother’s sister Olivia (far left, in rear) with her two grandsons in front of her. 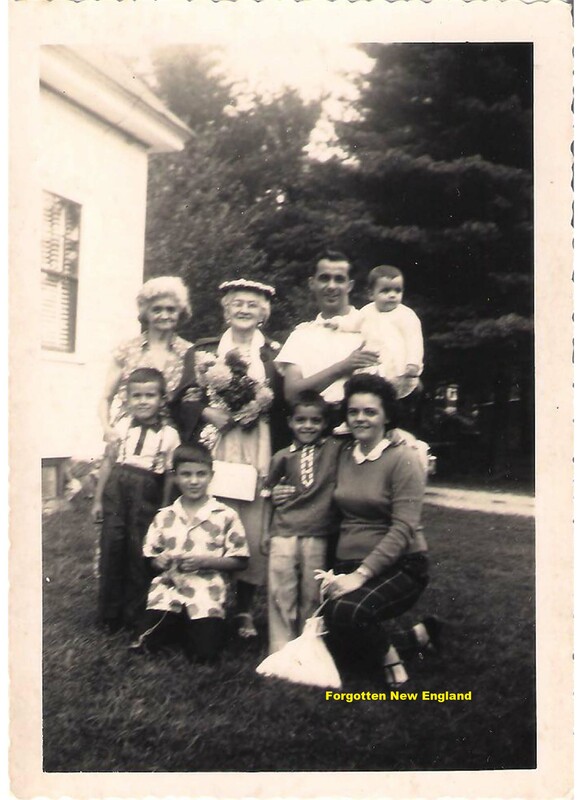 My great-grandmother, Augusta, next to her, in rear, appears with her youngest son William, wife Bernadette, and their two children, 1958. Bea and I exchanged a few emails. One of her emails included the stack of photographs that Augusta had, decades ago, sent to her cousins on Graciosa. In 2011, Bea had received them from another cousin who had grown up in the Azores. I had never seen these photographs. No one in my US-based family had seen them since Eisenhower and Kennedy were in office. Opening them was something like opening a time capsule. Images from my mid-century Portuguese family were downloading onto my hard drive. The first photograph, from August 1958, showed some familiar faces. My great-grandmother, Augusta, and her sister, Olivia, stood proudly outside Olivia’s South Barre (Massachusetts) home with their families. The back of the photograph identified Olivia’s two grandsons as being ten and five years old at the time. The youngest child in the photo, Augusta’s granddaughter, was just 14 months old at the time. In the photograph, Augusta’s son, my mom’s Uncle Billy, held her. He wasn’t even 30 years old when the photograph was taken in 1958; he passed away at the age of 81 in 2011. This photograph, dating from 1939, shows Augusta (the older woman on the right) and her sister Olivia (the older woman on the left) on the day that two of their sons married their brides. The next photograph, much older, shows another of my grandmother’s brothers, John, in 1939 on his wedding day. My great-grandmother appears in this photograph too, again with her sister Olivia. Two things I learned from this photo: 1. There was a close relationship between my great-grandmother and her sister that I hadn’t known about before. And, 2. my mom’s uncle John got married on the same day as one of Olivia’s sons. I still haven’t figured out which one. Another photograph shows a scene I’ve come across a few times in my collection of family photographs, the first TV picture. Most of us have them. They’re always black-and-white, in a living room, from the early 50s. This was the first I had seen for my great-grandparents. They had sent it to Portugal to show that they were doing well in the US. 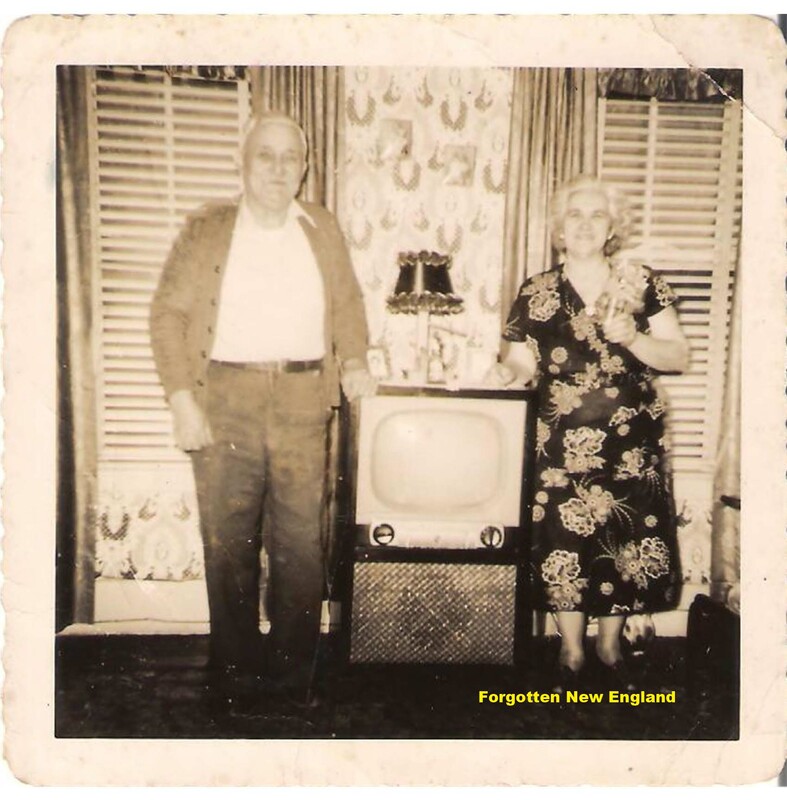 They proudly stand next to their brand new TV set, their first, in their Lowell, Massachusetts living room in the early 1950’s. You can almost feel their sense of happiness and accomplishment as you peer into this glimpse of their living room. There were several other photos too, a couple more showing Augusta and Olivia together, sometimes with their husbands, sometimes not. There was one of another sister, the youngest, who had survived them all. That photograph, of a birthday party thrown for her in the early 70s, was the most recent. Another showed an unidentified man in a suit on Lowell’s Central Street sometime in the late 50s. I’ll be working on that one to see if I can figure out who he is. I’m grateful to my newfound cousin Bea for tracking me down through Ancestry and sending me photographs of my family. It’s an interesting thought that, a half century after the photographs were mailed to the Azores, it takes just a click of a send button to return them to Massachusetts. Through Ancestry, email, and other forms of social media, it’s so much easier these days to form the kinds of connections that allow these sorts of things to happen. In this future, it’s becoming easier to find and understand the past. It has become a lot easier to find and share family stories with other family historians, researchers, and cousins. Amazing! Couldn’t agree more, it is so much easier to trace a family tree nowadays. Since I started researching my own family tree, we’ve become aware of numerous relatives we didn’t know we had! Thank you for another enjoyable article. How wonderful! The Internet has definitely broaded our ability to communicate and track down family. Thanks for the comments, all! It is great to use the internet to break down those brick wall mysteries in our family trees that have persisted for years! I had laid down my genealogy back in 1992. I just didnt have the time to drive to Taunton and New Bedford all the time. I recently picked it up again and with the help of the Internet have traced our family bac to France on 3 sides!